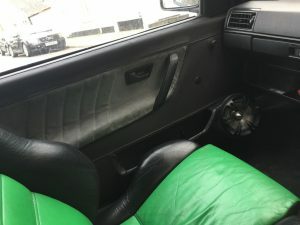 Well as you know, I had fitted the lovely green Color Concept seats, but still had done nothing with the rest of the interior panels or trim. 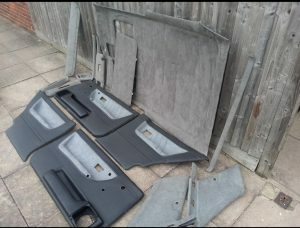 Sadly the headlining in the car had started to drop and the door cards were grubby and mismatched. It was time for a change. 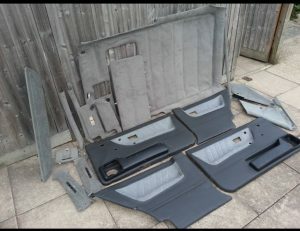 I had considered wrapping the door cards myself but when an full interior came up for sale already done, I couldn’t refuse. A short(!) trip to Wembly in rush hour traffic and I came home with this little lot. 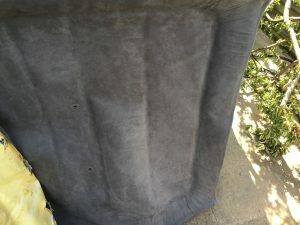 Sadly the headlining was covered over the top of the original fabric and so was starting to peel too. Time to fix that. 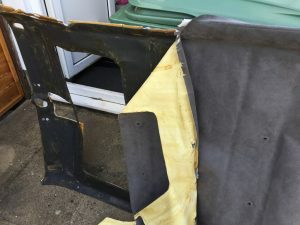 I repaired the headlining board with newspaper and PVA glue in a paper mache layer which seemed to work very well and glued the fabric back on. 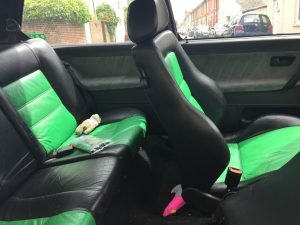 Typically MK2 Golfs will suffer with mushy door cards. 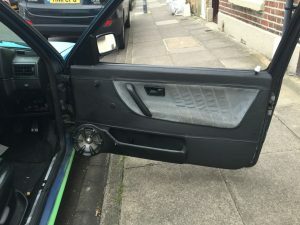 This is caused by leaks in the door membranes and generally destroys the door card. I wanted to stop that from happening so I applied a number of layers of waterproof varnish to the backs of the cards. This way, if there is damp there, the card will be fine. Here you can see I have also added some load spreading plates to help support the Speaker pods on the doors. 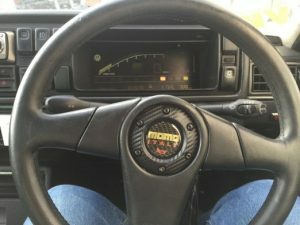 I have been wanting a new steering wheel for the car, as it was about the only thing that hasn’t been swapped at some point in it’s life. 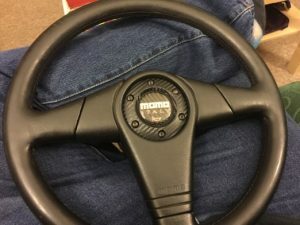 Got that fitted with a non genuine Momo horn push. I’m going to see if I can get a better surround 3D printed and wrapped in leather. Next time… Shiny stuff and some engine bits. 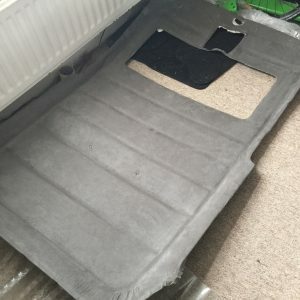 Previous Post: Don’t feed the Birds Part 12 – Digifiz! 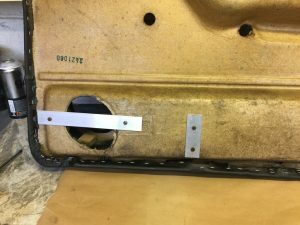 Next Post: Don’t feed the Birds Part 14 – Another new Sump? !